Install out of the Box for General Utility Cable TV and some Satellite and Antenna applications. This is really big cable with low RF Signal loss for Cable TV, some Satellite and Antenna applications where the Coaxial Cable RF / IF Signal Feed needs to be Installed Inside or Outside for long distances between Equipment and Premise. Low Signal Loss General Utility Coaxial that Features a PVC (Poly Vinyl Chloride) Jacket over (1) layer of 60% Aluminum Braid, Aluminum Foil Bonded Foam Dialectric with a Copper Clad Steel Center Conductor. Perfect for HDTV, DTV, DBS, Cable TV, Master Antenna and Satellite Master antenna Applications with 1.0 GHz Bandwidth. Can Also be Utilized as an Underground Signal Feed Transmission line from Towers, Dishes, Antennas and Telephone Poles to Home, Office and Premise. Note: Dual Shield (60% Braid) - Utility grade cable, this construction is based on the standard bonded foil (100%) dialectric, then adds an additional layer of shielding of braided aluminum (60%) to provide an economical solution that provides adequate isolation from most average network interference. Provides low attenuations for service drop inteconnecting jumper cables when compared to RG6 and RG59. Cable & Wire Shop's bulk RG11 cable ships in lengths of 500' and 1000' foot spools or pull boxes. 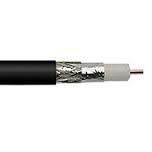 Our stock includes aerial, burial, dual shield and quad shield coaxial cable. In addition to our inventory of bulk RG11 cable, we stock RG11 drop cables, RG11 cable connectors, and a variety of coaxial cable tools and equipment. All cables are in stock and ready to ship today. If you have any questions, please contact Cable & Wire Shop at 1-877-660-0974.